Is Citigroup Even Worse Than Bank of America? Investors should be at least as leery of Citi as they are of Bank of America. NEW YORK ( InvestorPlace) -- Plenty of ugly headlines have been written about Bank of America ( BAC - Get Report) lately. There's the galling hubris of CEO Brian Moynihan , stating that the public is too quick to criticize such an altruistic bank. There's the panicked race to recapitalize, including $5 billion from Warren Buffett and the sale of a roughly $10 billion stake in China construction bank. There was an infuriating plan to gouge BofA customers $5 a month for a debit card, which has since been replaced by a less obtrusive campaign to nickel-and-dime them to death. Throw in the -55% performance of BAC stock year-to-date, and a -90% flop from the pre-recession peak, and you've got lots of reasons to hate Bank of America. However, lost in the noise may be the fact that BofA isn't alone in its antics. There are just as many reasons -- perhaps even more -- to dislike Citigroup ( C - Get Report). The financial giant was the biggest recipient of government largess amid the TARP bailouts, with the federal government owning a 36% stake at the worst stage of the downturn. Some $25 billion in emergency aid was converted into common shares, which have since been sold as Uncle Sam has exited the "investment" in Citi stock. That alone should make folks just as leery of Citigroup as Bank of America when it comes to "too big to fail" institutions that seem to profit while average Americans suffer. The irony is that Citi may now be even bigger than before, meaning it has only a better chance of needing a government handout in the event of another shock. 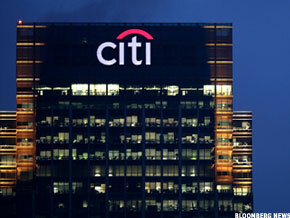 According to The Banker magazine, data from the end of 2010 shows Citi as the fourth-largest bank in the world. The consolidation in the financial industry has made Citigroup even more entrenched than before. Mammoth size doesn't stop Citi from squeezing out more profits. Most recently, news reports say it will cut more than 3,000 workers. That's a fraction of the 30,000 layoffs Bank of America is working out, but let's not forget a brutal slash-and-burn at Citigroup in late 2008 that resulted in some 50,000 pink slips and planned eliminations. The worst part is that this second, smaller round comes after Citi has seen significant year-over-year gains in both revenue and earnings each quarter since its return to profitability in 2010. With consistent profits and a dominant role in global banking, it's not like cutting those 3,000 workers will be holding off bankruptcy. This is, of course, part of a larger industry-wide trend. Banking industry layoffs are projected to top 200,000 this year. Is Race to Recapitalize a Sign of Panic? Aside from the layoffs, BofA and Citi share other similarities. Just as Bank of America has been racing to recapitalize, Citigroup also is selling off assets to meet higher regulatory standards and to hoard cash. The $4.1 sale of EMI Group's music and publishing businesses seem logical, considering they're "noncore" operations. However the planned sale of its consumer finance and credit card business shows Citi shares BofA's need to divest operations even if they're qualified and have the potential for growth. Rebranded as OneMain, the business has a book value of about $2 billion and roughly $13 billion of assets. Then there was the recent sale of home-loan servicing operations with a portfolio value of $2.6 billion. We can quibble over whether the timing was right on EMI or whether the OneMain and loan servicing moves are necessary to move Citi away from risky debt. But the bottom line is this difficult credit markets has all but assured Citigroup isn't going to get the best deal on these operations. Lenders are reluctant to finance big price tags, which sets a ceiling on even attractive assets. In fact, the multibillion-dollar price tag on One Main has prompted Citi to offer financing through its own operations just to entice a buyer. What kind of transaction is that? If the businesses are indeed ugly and worth getting rid of, Citi has failed to significantly limit risks by fronting the money for a sale. What if another recession strikes, business craters and the buyer defaults? After all, that's how Citi got stuck holding EMI in the first place. It all makes you wonder just how desperate Citi is to unload operations and shore up its balance sheet. Some claim Citigroup is far removed from the brink of failure. In fact, recent improvements in bad debt metrics bear this out, as does the longer-term trend. However, the hardest thing about the financial sector is making sense of all the noise. In October, there were rather shady earnings from BofA, Citi and JPMorgan Chase ( JPM - Get Report) that moved numbers around a spreadsheet to magically create profits for the companies. Citigroup in particular benefited in the third quarter from a "paper gain" of $1.9 billion, thanks to an increase in the perceived riskiness of its debt and not true business operations. Defenders will point out that in 2010, Citigroup achieved its first profitable year since 2007 -- and has stayed in the black ever since. Also, late in 2010, the government sold its remaining stake in the company, so Uncle Sam is no longer looming large over the operations. But that doesn't necessarily mean the bank is safe and will never need federal aid again. And next time, given the dire straits of the government's own finances and the focus on federal spending, a bailout may be very difficult to come by. What's more, BofA CEO Brian Moynihan recently opined about the "new normal" in retail banking that will lead to much smaller profits. That's even as proposed and planned regulations -- such as the Basel III capital requirements and the so called Volker Rule limiting speculative investments -- have yet to full take effect. It all ads up to a whole lot of uncertainty for the financial sector, and for Citi. Since the financial crisis, this market has showed us time and time again that investors can get burned very quickly if they make the wrong moves. Right now, the financial sector has too many disturbing signs and unknowns. And like Bank of America, Citigroup is one of the biggest offenders -- and, therefore, your worst investment. Jeff Reeves is the editor of InvestorPlace.com. Write him at editor@investorplace.com, follow him on Twitter via @JeffReevesIP and become a fan of InvestorPlace on Facebook . As of this writing, he did not own a position in any of the aforementioned stocks.